I’ve always rather liked the Spectrum building or the Renault building as it tends to be referred to, even though the car company moved out of it some years ago. I didn’t though know very much about it until recently. Whilst I did know that it had been used in a Bond film – ‘A view to a Kill’ in 1984 – I didn’t know that it was designed by none other than Sir Norman Foster, internationally renowned architect. I also was ignorant of the fact that the design won a number of awards including the prestigious Financial Times ‘Architecture at Work’ Award in 1984. Famous for his steel and glass designs, Lord Foster created the Gherkin and Millennium Bridge in London, rebuilt Berlin’s Reichstag and also Hong Kong Airport, so our building is in illustrious company. Being such an iconic building it’s unsurprising that there’s reams of writing about it on the internet. But as ever our very own Swindon Web has an informative article about it. From there I learned that: ‘this was not Sir Norman’s first Swindon FT winning design. 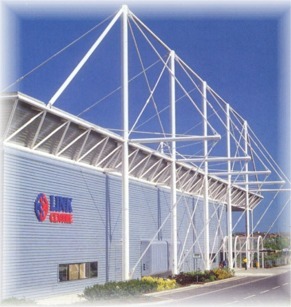 He won the same award for his design of the Reliance Controls Electronics Factory, Greenbridge, Swindon in 1967. The building was unfortunately demolished in 1991 to make way for PC World.’ I know I’ve said I don’t want to use this blog as a place to rant and rave but seriously – what?! Why would someone do that? 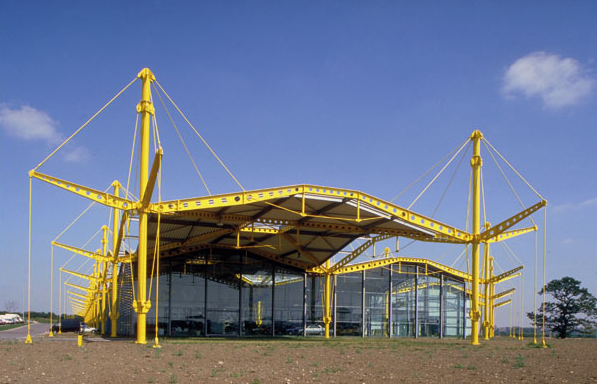 So it’s great to hear this week that the Renault/Spectrum building has now been given Grade II listed status by English Heritage in what it describes as a move to ‘protect post-war’ architecture. I confess I also rather like The Link Centre building at West Swindon and the David Murray John building, also known as the Brunel Tower, in the town centre. 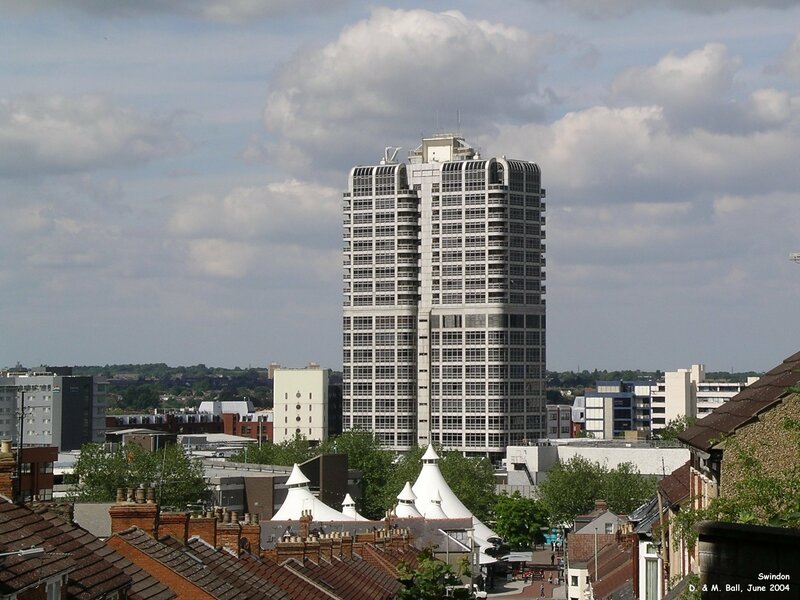 It stands like a giant exclamation mark on the Swindon skyline – it’s fab. I once had the opportunity to go to the top of that particular building and it was really quite a revelation – one could clearly see the route the canal would have taken for a start. It was all quite fascinating. “Designed by Douglas Stephen and built in the Seventies, this tower is a sleek, slick return to the smooth white grace of Twenties and Thirties Modernism. It’s a mixed-use building, incorporating social housing, offices and retail, which is rare in Britain. Stephen was a communist and believed in architecture as a power for social good.” Meades’ list includes Marseille Cathedral and Stewart’s Melville College in Edinburgh so our building is held in esteem with some exalted company. Brian Carter of Carter Collectables has some great photos of the Renault Building and the Link Centre under construction on his Flicker collection. And of course the website of the architect himself and his company has some amazing photographs and an absolute wealth of information about the building. It is a stunning construction. Hello Matthew – thank you so much for sharing these. Anyone out there that worked there?